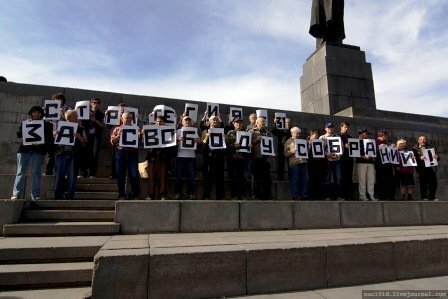 Yekaterinburg: where have all the opposition gone? The past few months have seen a number of opposition activists from the western Siberian city of Yekaterinburg arrested, threatened, prosecuted and imprisoned. Some have even been forced to flee the country. Might this be the prelude to a more nationwide campaign, wonders Pavel Stroilov? So reads an SOS from Russian journalist and human rights campaigner Sergei Kuznetsov, covertly passed to the author of this article yesterday. Alas, these days it is not an unusual event to get crisis messages from contemporary Russia. Worse still, there is very little one can do with them. This one, however, is not actually from Russia itself. Kuznetsov, a veteran dissident and former Soviet political prisoner, is now jailed by one of the Western democracies - Israel. Sergei Kuznetsov, who was one of the last political prisoners in the Soviet Union, has now been detained by the Israeli authorities. He may soon be on the way to Georgia, who are said to have offered him political asylum. Kuznetsov has been a thorn in Putin's side for many years. The Yekaterinburg activist won a landmark free speech case against Russia in European Court of Human Rights in 2008, and is still fighting three other Strasbourg cases. This summer, he received 'very persuasive' threats to his life and had to flee to Israel, where he applied for political asylum. However, he believes the Israelis are under strong pressure from Russia to send him back, and this is why they keep him in prison. He has also applied for asylum in the UK through the British embassy in Tel Aviv, and attempted to board a plane to London without a British visa in mid-July. It was at that point that he was arrested by the Israelis pending the consideration of his asylum claims. His protests against that imprisonment and against delays in considering his case have landed him in the punishment cell where he is now. "In the past few months, we have seen a swift and ruthless campaign of persecution against opposition activists in Yekaterinburg." Clearly, Israelis have every reason to be nervous about any strange man trying to board a plane in a resolute mood and without a visa. They also have more urgent worries than the Russian threat. But their approach to Kuznetsov's case is typical of the entire Western world. We, it seems, have too much on our plates to worry about human rights in Russia. Russian dissidents, refugees, and political prisoners are seen as merely a nuisance; or, at best, a minor 'humanitarian' problem in a long list of other minor problems. With this short-sighted attitude, no wonder Israeli and British authorities overlook the historic significance of Kuznetsov's case (and I am choosing words carefully here). In the past few months, we have seen a swift and ruthless campaign of persecution against opposition activists in Yekaterinburg. Russian opposition groups are mainly regional, and the Yekaterinburg community had been one of the strongest and fastest-growing. It had even won certain liberties still denied in Moscow and St. Petersburg: for example, their 'Strategy 31' rallies to this day are not usually dispersed by force (even though the organisers may be persecuted later). The Strasbourg judgement in Kuznetsov v Russia was probably instrumental in achieving these liberties. Today, however, almost all leading figures from Yekateriburg's opposition has been driven into exile, imprisoned, or is facing criminal charges. For example, police whistleblower Igor Konygin and local 'Strategy 31' coordinator Evgeny Legedin now face prosecution and up to three years in prison for supposedly 'libelling' the regional prosecutor. At one street protest, Konygin and Legedin held a banner alleging the prosecutor was covering up corruption in the police. After the case was allocated to a notorious 'puppet judge', Legedin fled to Britain and applied for political asylum. Konygin remains in Yekaterinburg, his future uncertain (to say the least). 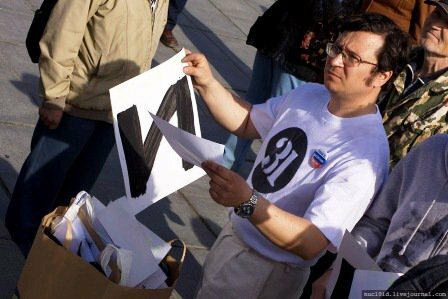 Another "Strategy 31" coordinator, the regional 'Yabloko' Party leader and local parliamentarian Maxim Petlin was arrested in August. His case is another outright political fabrication: his campaign against a controversial construction project was distorted as a way of extorting money from the construction company. Initially released on bail, Petlin went on with his protests, which were then alleged to be his way of putting pressure on witnesses. So he has been put in pre-trial detention, sharing a 9 sq. m. cell with four other prisoners, and sleeping only in turns. Today, the regional court has rejected his appeal against the detention order. Little wonder, given what we know about Russia's independent judiciary. If convicted, Petlin faces up to fifteen years in prison. Legedin, who has founded a Petlin Support Committee to campaign against the persecution of his colleague, believes the Kremlin may be planning to turn Petlin's case into a 'show trial of Khodorkovsky proportions'. Facing up to three years in prison, human rights activist Evgnei Legedin fled to UK and requested political asylum. The Russian security services have made a special effort to curtail opposition activities in the Urals' largest city. Russia’s secret services have historically prepared large operations by trying them out on a smaller training ground. The worry now is that the purge of Yekaterinburg might be only the beginning of something much bigger. According to Kuznetsov and Legedin, the man in charge of it was Nikolai Vinnichenko, the official Representative of President of Russia in the Urals. Having accomplished his mission, Vinnichenko has been promoted to the position of President's Representative in the North West. There is a real danger that St. Petersburg's opposition groups are next in line for persecution. This is not to say that they had been safe before Vinnichenko's arrival, of course. 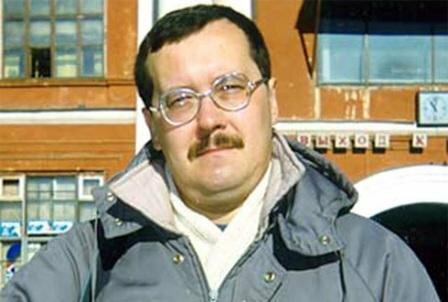 St. Petersburg's 'Other Russia' leader Andrei Dmitriyev and nine other activists are already facing 'extremism' charges. "Russia’s secret services have historically prepared large operations by trying them out on a smaller training ground. The worry now is that the purge of Yekaterinburg might be only the beginning of something much bigger." Worrying news is coming from many other Russian regions as well. In Novokuznetsk, Strategy-31 organiser Denis Shakin was taken to a police station on 26 August, cruelly beaten, and told to stop his 'extremist activities'. In Nizhny Novgorod, Artem Bystrov and several other activists have been arrested in a fabricated case against a fictional 'extremist' organisation. In Barnaul, anarchists Vitaly Leonov, Sergei Sandin and Daniil Malyshkin face imprisonment for ridiculing Putin and Medvedev in graffiti. The evidence suggests the the wheels of larger project has already been set in motion all over Russia. Yekaterinburg was simply the first in the line. The stakes are high. We know the Kremlin is notoriously paranoid about the date 2012. They realise nobody will believe in their elections, and thus seriously fear an Ukrainian-style 'Orange Revolution' or some other Arab-style 'Russian spring' afterwards. No doubt, this largely imaginary threat will be countered with a very real, very brutal response. Russian police has recently been given discretionary powers to use water cannons, tear gas, electric shockers and truncheons to disperse peaceful demonstrations. The West faces a hard choice between risking confrontation and risking complicity.